There’s no need to do legwork when professionals have already done it for you. Those looking to add low-maintenance plants into a landscape need not look any further than the Nifty 50, a list of water-wise plants perfectly-suited to San Diego’s climate and soil conditions. The helpful list was first developed in 2001 by the Metropolitan Water District of Southern California. In 2006, the list was revised by staff at the Water Conservation Garden at Cuyamaca College. 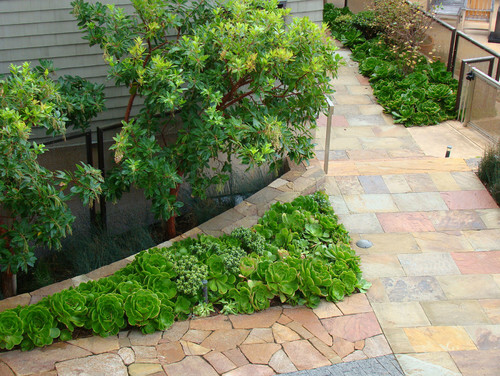 The most recent 2009 revision was authored by a group of San Diego experts in conjunction with the Water Conservation Garden in order to identify exactly which species of a particular plant meets the rigid criteria of the Nifty 50 list. For example, California lilac is a member of the list, however, varieties bloom in different colors and grow in different heights. If there isn’t a particular species listed, as in the case of agaves (pictured below), then all are considered acceptable in San Diego landscapes. There won’t be a need to hunt down any exotic plants. Each Nifty 50 list member is (usually) readily available at local nurseries around San Diego. Of course, if the nursery is out of stock or if you need a larger quantify than they have on the lot, inquire about placing a special order. Each plant is easy to grow and scaled to a residential environment. Though the panel took great pains to include some trees, you won’t see any 40′ specimens and or similar on the list. To maintain the sanity of home gardeners, no members of the Nifty 50 are invasive plants so there’s no need to worry about containment or encroaching on the neighbor’s yard. After Nifty 50 plants are established, water isn’t something they’ll require much of. 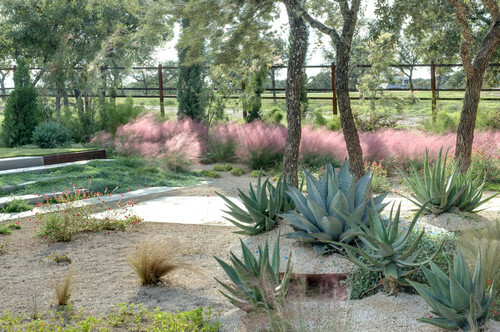 All are water-wise and perfect for xeriscaping and drought-tolerant gardens. Those seeking tropical garden design should probably look elsewhere as, you guessed it, most are native plants. And, rest assured that each plant was also chosen based on visual interest for boasting pretty flowers, interesting leaf shape and an aesthetically-pleasing overall look. To see the Nifty 50 plants growing in real life, visit the Water Conservation Garden. Keep in mind that the list is meant to serve as a useful reference and not to exclude gardeners from incorporating other suitable plants. If there is an “N” after the name this indicates that the plant is native to the area. The Water Conservation Garden offers a beautiful brochure including both the name and photo of each plant. Download it here. I Have the List. Now What? 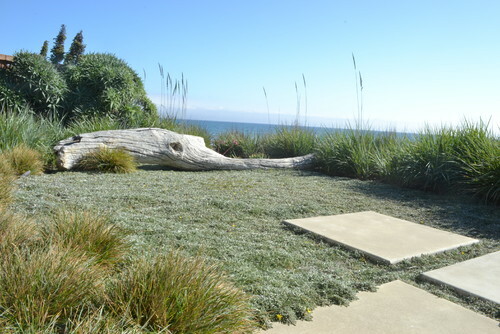 Reduce your water bill by replacing the lawn with synthetic turf, Nifty 50 ground covers or both. Woolley Thyme and Dymondia (pictured above) are common choices for either full lawns or small spaces between pavers. Dymondia holds up to foot traffic and is also one of our recommendations for dog-friendly ground covers. Keep plants that have the same water requirements near each other as though a Nifty 50 plant may look lovely next to a water-guzzling canna, in this scenario, the risk of over-watering and killing the new plant is high. Take a photo of the space on your phone (or, better yet, print a large version) and bring it to the nursery if you need help determining which Nifty 50 members best accent a particular space. New plants provide an opportunity to re-evaluate irrigation. Check for leaks. If replacing new plants with Nifty 50 list members, a reduction in watering might be necessary. 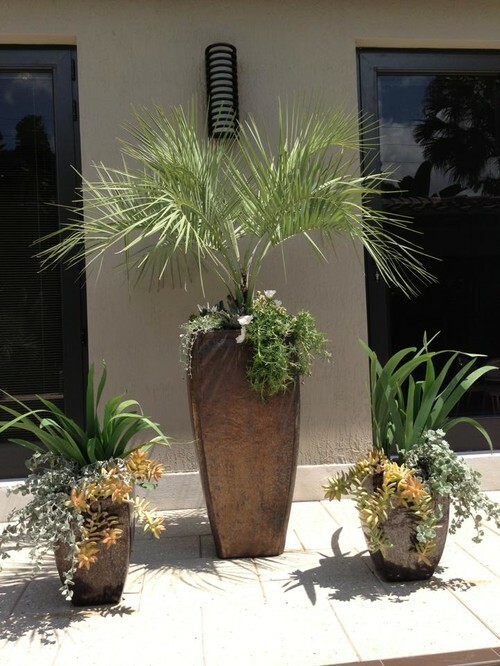 Even Nifty 50 list member, pindo palm, thrives in a container garden setting accompanied by low water succulents. Containers tend to dry out quickly so these plants are perfect for those who are unable to water frequently (or have trouble remembering to do so). Though we’ve covered the merits of vertical gardens, another option is using vines on the Nifty 50 list to cover unsightly fencing or add more visual interest to the side of your home. With it’s pretty pink flowers and dense growing habit, bougainvillea is a very common trellis and fence cover in San Diego (be mindful of thorns). Regardless of whether or not you have a landscaping need, a half-day at the Water Conservation Garden is fun for all ages. Not only can you view the entire Nifty 50 list growing naturally, but kid-friendly activities ranging from Children’s Discovery Trail to organized field trips are on offer for young gardeners. Over 5 acres of displays showcase water conservation through gardens and how-to displays. Admission is also free. Have you utilized the Nifty 50 plant list?